1. 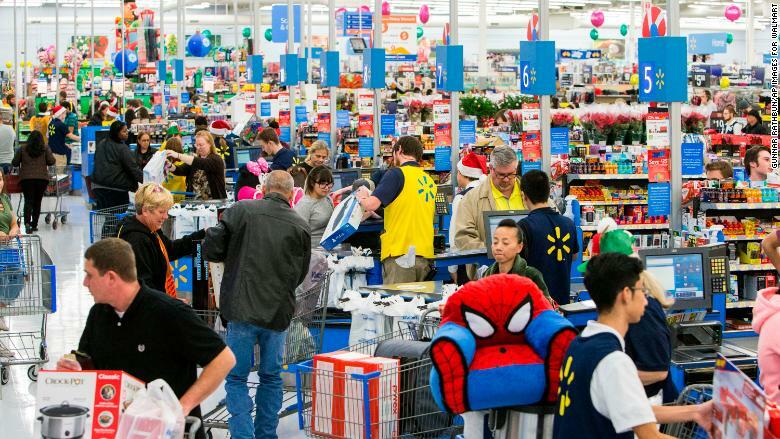 Cyber Monday: U.S. retailers are hoping for a major splurge on Cyber Monday. The online shopping bonanza is expected to bring in as much as $6 billion, according to Adobe Digital Insights, which tracks online spending at America's 100 largest retail websites. Digital sales have been strong this holiday shopping season: American shoppers spent a record $5 billion online in 24 hours on Black Friday, a 16.9% increase over last year, according Adobe Digital Insights. The performance is welcome news for embattled retailers who were having a dismal 2017. Store closings have more than tripled this year to a record 6,700. 2. Dollar under pressure: The U.S. dollar was trading lower against major currencies on Monday. Investors are looking ahead to a U.S. Senate vote that could come later this week on tax reform. If the legislation gets through the Senate, it will have to be reconciled with the bill the House passed earlier this month. That process could be messy, and progress could stall. "The dollar would get a bit of a lift from anything that convinced markets that a growth-supportive package was really likely but more muddle seems more probable," said Kit Juckes, a strategist at Societe Generale. The dollar suffered its biggest fall on Monday against the euro, which got a boost from strong eurozone economic data and signs that German Chancellor Angela Merkel is making progress in forming a government. 3. Time's new owners: Media firm Meredith (MDP) has agreed to buy the publisher Time Inc. (TIME) for $2.8 billion. Acquiring the legendary magazine business gives Meredith control of dozens of big titles such as People, Sports Illustrated, Fortune and Entertainment Weekly. Meredith already publishes several top magazines, including Parents, Shape and Better Homes & Gardens. It plans to sell a sizable chunk of the combined business -- $650 million worth -- to a company owned by GOP mega-donors Charles and David Koch. European markets advanced in early trade following a negative session in Asia. The S&P 500 gained 0.2% on Friday, closing above 2,600 for the first time. The Dow Jones industrial average added 0.1%, while the Nasdaq increased 0.3% to hit a new record. U.S. crude futures were off by almost 1% on Monday, ahead of a crucial OPEC meeting later this week. 5. Companies and economics: Shares in Samsung (SSNLF) dropped as much as 5% on Monday after analysts at Morgan Stanley reportedly downgraded the company. The U.S. Census Bureau will release its October new home sales report at 10:00 a.m. ET Monday. Editor's Note: Sunday's "Before the Bell" newsletter contained an error in the item about the record S&P 500 run without a 3% decline. It has been corrected here.